A social media campaign calling itself "Blacktivist" and linked to the Russian government used both Facebook and Twitter in an apparent attempt to amplify racial tensions during the U.S. presidential election, two sources with knowledge of the matter told CNN. The Twitter account has been handed over to Congress; the Facebook account is expected to be handed over in the coming days. Both Blacktivist accounts, each of which used the handle Blacktivists, regularly shared content intended to stoke outrage. "Black people should wake up as soon as possible," one post on the Twitter account read. "Black families are divided and destroyed by mass incarceration and death of black men," another read. The accounts also posted videos of police violence against African Americans. The Blacktivist accounts provide further evidence that Russian-linked social media accounts saw racial tensions as something to be exploited in order to achieve the broader Russian goal of dividing Americans and creating chaos in U.S. politics during a campaign in which race repeatedly became an issue. The Facebook account had 360,000 likes, more than the verified Black Lives Matter account on Facebook, which currently has just over 301,000. The page also publicized at least seven rallies and demonstrations around the country in 2016. The events ranged from the 50th anniversary of the Black Panther Party to a march in Baltimore commemorating the death of Freddie Gray. 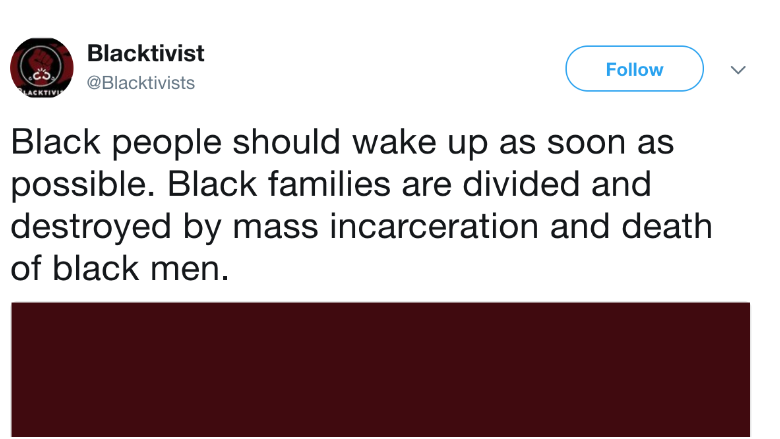 In several cases, it appears that the events were real, and were organized by other groups, but that the Blacktivist account was working to increase turnout. "We are fed up with police violence, racism, intolerance and injustice that passed down from generation to generation. We are fed up with government ignorance and the system failing black people," the page's description of the march for Freddie Gray read. That same Freddie Gray event was covered by RT, a television network funded by the Russian government. CNN reported Wednesday that at least one of the Facebook ads bought by Russians during the 2016 presidential campaign referenced Black Lives Matter and was specifically targeted to reach audiences in Ferguson, Missouri and Baltimore, two cities that had gained widespread attention for the large and violent protests over police shootings of black men. The Twitter account, @Blacktivists, provided several clues that in hindsight indicate it was not what it purported to be. In several tweets, it employed awkward phrasing that a native English speaker would be unlikely to use. It also consistently posted using an apostrophe facing the wrong way, i.e. "it`s" instead of "it's." The Blacktivist Facebook account was among the 470 Russian-linked accounts identified by the social media network and disclosed to Congress earlier this month, the sources said. The matching Twitter account was among the roughly 200 accounts Twitter identified with links to those found by Facebook. Facebook shared its findings about the accounts with Twitter, enabling Twitter to identify 22 matching accounts and an additional 179 accounts that linked back to those accounts, the sources said. This matching process went beyond public-facing similarities and included private information that could link the accounts. All of the ads handed over by Facebook were linked to the Internet Research Agency, a shadowy company that U.S. military intelligence has described as "a state-funded organization that blogs and tweets on behalf of the Kremlin." A senior Kremlin spokesman said last week that Russia did not buy ads on Facebook to influence the election. As with the Russian-backed Facebook accounts, the Russian-backed Twitter accounts sought to amplify political discord by highlighting hot-button political issues like race and immigration. Some of the Twitter accounts also promoted anti-Hillary Clinton stories, a source with knowledge of the matter told CNN. The U.S. intelligence community believes one reason Russia meddled in the election was to damage Clinton's chances of winning. 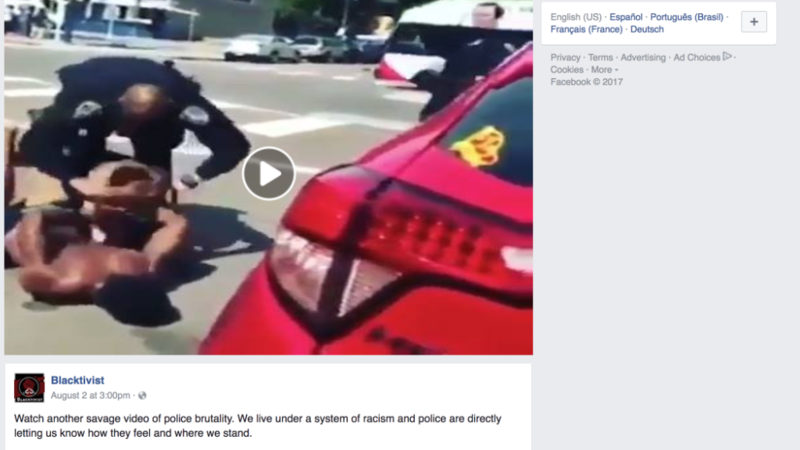 Blacktivist posted a video on Facebook in August of this year with the caption, "Watch another savage video of police brutality. We live under a system of racism and police are directly letting us know how they feel and where we stand." The video was from a July incident in San Diego in which a police dog was seen biting an African-American man in handcuffs. CNN has not confirmed when the Blacktivist Facebook account was established. The corresponding Twitter account was set up in April 2016, according to cached page records. "Black community welcomes you! We want to bring peace in life of our brothers and sisters!" the "About" section of the Facebook page read. One of the Russian-bought Facebook ads that the social media network is handing over to Congress backed Green Party candidate Jill Stein. "Choose peace and vote for Jill Stein," the ad read. "The only way to take our country back is to stop voting for the corporations and banks that own us. #GrowaSpineVoteJillStein." The Stein ad was first reported by Politico. A segment of that wording appeared verbatim on the @Blacktivists Twitter account on November 2, 2016. "Choose peace and vote for Jill Stein. Trust me, it's not a wasted vote," the account tweeted. Both accounts appear to have been active as recently as last month. -- CNN's Marshall Cohen contributed reporting.